Note the headwaters of the Ottawa River near the top of the map. 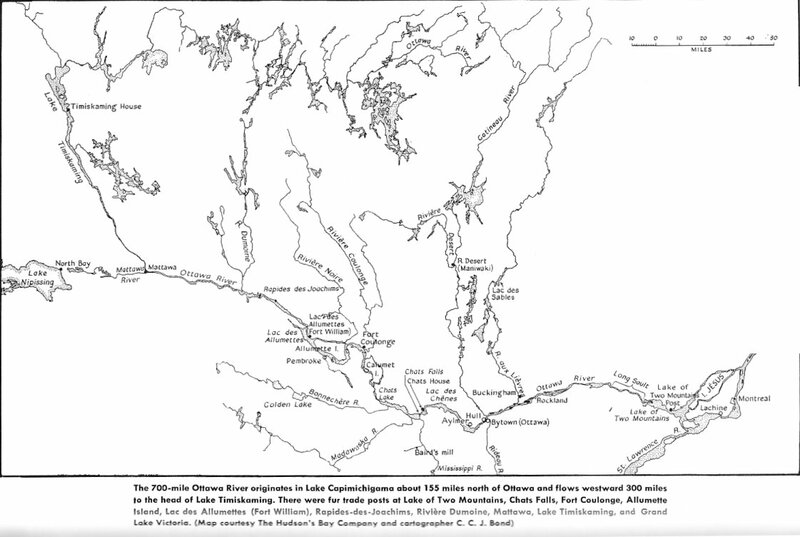 The River starts out to the east of Ottawa / Hull and enters the national capital area from the west. Trivia Question: What is the source of the Ottawa River? The Ottawa River is a Canadian Heritage River. Got your contact info on bytown.net. Continue Refilling Holden and Des Joachims through the week. (The Dumoine River flows into the Ottawa near here). The operating range is 173.74 to 177.70 m. Expect daily water level fluctuations of up to 30 cm. Expect daily water level fluctuations of up to 80 cm. The normal operating range is 149.40 to 152.40 m. Expect daily water level fluctuations of up to 10 cm. The normal operating range is 84.73 to 86.87 m. Expect daily water level fluctuations of up to 80 cm. incidental, consequential or special damages. Note: The podcast available on Greg's site is well worth listening to. Download it to your tablet or 'phone and enjoy. Lots of very good First Nations history in our area.